Have you been at Lekki Heights Lagos? Write a review!!! Lekki Heights is a luxurious hotel located in the highbrow Lekki area with a panoramic view of the lagoon. 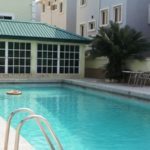 Its location also provides easy access to the famous Lekki Beach. WiFi is available in all guest rooms. Each room in the hotel is spacious and has an en-suite bathroom, a TV with DSTV channels, a fully stocked mini bar and a telephone. The suites have a separate lounge area. Its on-site restaurant offers both continental and Nigerian cuisine which guests can enjoy in the cosy dining room. Guests can also enjoy classic cocktails, wines and soft drinks while relaxing at the executive lounge bar on the second floor or outdoors by the pool. The hotel features a gymnasium with modern fitness equipment. The hotel features a banquet/conference hall to host social and corporate style events. The hotel provides stable electricity and offers ample parking space. Laundry services can also be arranged.